Cincinnati, OH (June 22, 2012) – The International Right to Life Federation (IRTLF) is pleased to announce that pro-life leader Bradley Mattes has been named its new president. Mr. Mattes succeeds the distinguished pro-life pioneer, J.C. Willke, MD, who has served as president since the organization’s founding in 1984. The International Right to Life Federation is dedicated to the protection of innocent human life across the globe. For 28 years, it has been engaged in educational, charitable and scientific activities to protect the unborn and defenseless. No other comparable international organization exists which embraces pro-life organizations in a tried and tested constitutional structure. The IRTLF Board consists of representatives from twelve regions including: the United States, Canada, Latin America, Africa, Indian sub-continent, United Kingdom, Western Europe, Australia/New Zealand, Pacific Rim, Eastern and Central Europe and Central America. In a unanimous vote, members of the board selected Bradley Mattes to represent the organization as its president. 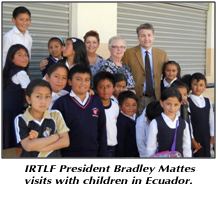 Dr. Willke has faithfully served IRTLF as president, partnering with pro-life leaders from around the world in this vital mission. This year, he decided to retire from this role. Ma ttes possesses a rich pro-life history, serving as an advocate for 37 years. He is the executive director and co-founder with Willke of Life Issues Institute, an organization established to serve the educational needs of the pro-life movement. He hosts a daily radio commentary on abortion and related issues and is also a 2010 Regional Emmy® award winning host and executive producer of the weekly pro-life television program Facing Life Head-On. About the IRTLF: The International Right to Life Federation is a world-wide federation of autonomous, national pro-life groups and individuals. Formed by members from over 11 countries, IRTLF is non-sectarian and non-political. It is dedicated to imparting and exchanging information to every nation in the world with the single mission of achieving legal protection for all innocent human life from conception until natural death. This entry was posted in International, International Right to Life Federation, Press Releases by Editor. Bookmark the permalink.